Michael McFaul was appointed US Ambassador to Russia on 17 December 2011. Writer and political scientist Igor Panarin believes the new ambassador is likely to try to influence Russia’s upcoming presidential election. Michael McFaul is a Stanford graduate with a Ph.D. in international relations from Oxford University. He first visited Russia in 1983 and stayed for some time while studying for his Ph.D. at Oxford. McFaul went on to spend several years living in Russia in the 1990s, working for the Carnegie Moscow Center. President Obama’s nomination of McFaul to serve as the US Ambassador to Moscow became public in May this year. At the time, McFaul was Senior Director for Russian and Eurasian Affairs for the US National Security Council. McFaul’s candidacy was submitted to Congress for endorsement in September. He would have started his work in Moscow as early as November 2011, during the final stages of Russia’s recent parliamentary election, if not for the Republican Party, which barred his appointment twice for partisan reasons as it tried to gain an edge in the 2012 presidential campaign which is just heating up in the United States. It was therefore due to the GOP’s stubborn opposition that McFaul was unable to communicate the US Secretary of State Hillary Clinton’s critical attitude vis-à-vis the Russian election to the leaders of Russia’s so-called “extra-systemic” opposition during the December protests in Moscow. In fact, Mr. McFaul himself must have a thing or two to say about Russia’s democracy, being one of America’s most prominent experts on Russia. McFaul speaks fluent Russian and has authored and edited over 20 books on democratic governance. A joint McFaul–Surkov working group on civil society [ Vladislav Surkov has held the post of first deputy of the Presidential Administration since 2008 and is believed to be one of the most influential politicians in Russia and the main architect of the country's current political system – RT. ] was set up in July 2009 through a joint decree by the Russian and US presidents. In this capacity, McFaul had an extensive opportunity to meet Russian human rights advocates, opposition leaders and prominent press people. In 2002, McFaul founded a Center on Democracy, Development and the Rule of Law at Stanford University. He is still among the Center’s faculty today, which is why it was especially interesting for me to visit the Center in late November this year and discuss prospects for US-Russia relations post 2012 with its leading analysts. It should be noted that the political school of thought created by Michael McFaul looks very impressive, as it comprises foreign policy professionals and reputed experts on Russia and the post-Soviet space. McFaul’s team of experts is proficient in using political technologies and PR strategies, and it shares a strong focus on “promoting democracy” in Russia. These policy makers have developed their own vision of what democracy should be like in Russia, and are ready to offer their recipes to Russia’s liberal opposition – but in a soft and subtle way. As soon as Russia was through with its parliamentary election this December, a number of American and British news outlets launched a media offensive against it. As part of the smear campaign, FOX News ran footage of the Greek riots featuring arson and looting for several days, trying to pass it off as Moscow’s post-election protests. One should expect that McFaul’s arrival in Moscow is bound to increase the media pressure on Russia’s leaders, since the American and British political elites are keen on preventing Vladimir Putin from assuming office for another term. It is only the tactics that are likely to change with McFaul as ambassador. McFaul is aware of the Russian “extra-systemic” opposition’s major advantages and downsides. He earlier contributed to the creation of a network of Western-funded NGOs in Russia. This makes him a highly efficient advisor when it comes to “promoting democracy” in Russia. In the meantime, there are plenty of human rights activists in Russia who are ready and waiting to upload “sensational” footage of alleged electoral fraud on the Internet in order to discredit Russia’s upcoming presidential election. New political technologies have been successfully tested during the recent unrest in the Middle East. What Professor McFaul is going to do now is fine-tune them to the Russian situation and to the presidential election campaign in particular. 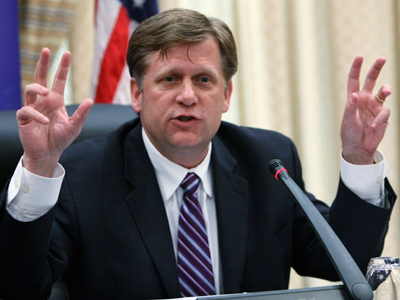 We can expect Michael McFaul to make his big move as early as late January 2012. Is the Russian government ready for this?